**Note** This is another update to previous posts on CopBlock.org (here, here, here, here, and here) featuring photos and video from the “Justice for Africa” protests in Los Angeles over the killing of yet another unarmed person: This update includes additional video, as well as commentary from Jason Nellis, who blogs at “The World as Seen by Jazoof” and has also been involved with Nevada Cop Block and other Las Vegas area groups. 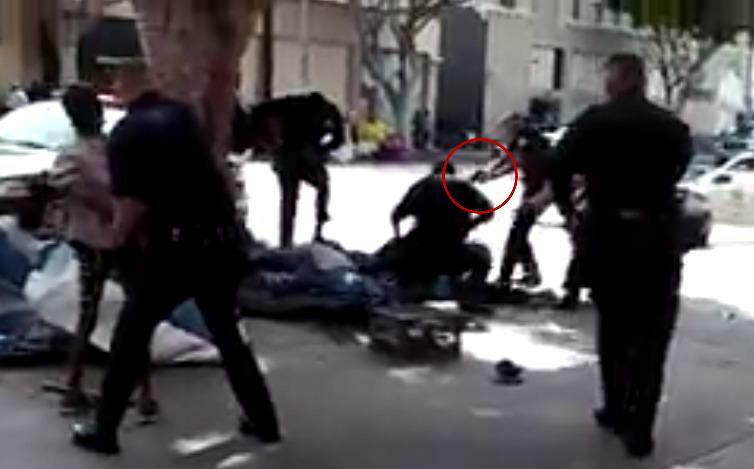 Jason, a native of Los Angeles, who now lives in Las Vegas, was present during the initial protests at the LAPD HQ, after the very public murder of a man initially known only as “Africa,” who has since been identified as Charley Keunang. UPDATE: “Africa’s” name is Charley Keunang. 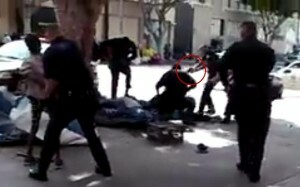 On March 1st, 2015 in downtown Los Angeles, a homeless Skid Row resident, who went by the name “Africa,” was attacked and shot to death by police, and it was all caught on video that went viral almost instantly, enraging the nation once again. As usual, I shared and ranted about it, but this time it had the uncommon element of propelling me to go out there (not that easy for me, but at least just in the next state over, and LA is my hometown – last time a video called for me to come was Bundy Ranch), and when I heard there was going to be a protest on the morning of Tuesday March 3rd, I took the bus out there Monday night just before midnight. As soon as I got to Grand Central Station at 6:20am, I sat down and overheard people near me playing the video on repeat, loudly. Others commented on it and this brought to the forefront how real and big this had gotten so quickly. I told them about the protest and they said they would try to go. I got to the protest site at 6th and San Pedro about 7:45 (AM), and at least 50 people surrounded the memorial where he had been killed in front of a tree. It quickly grew to over 200 people, and the energy maintained by songs, speeches, chants, and drums was very palpable. We began marching up San Pedro around 8:30. We turned on a street towards the LAPD Headquarters and at I believe Temple, a line of bicycle cops awaited us. After a few moments of being surrounded (mostly by press), they dispersed and took off on their bikes to let us through. Instead of continuing straight up the hill, we turned and marched behind them, onward to LAPD HQ. When we arrived at the behemoth LAPD Headquarters around 9, there had to be well over 300 people in the open area. The energy was kicked up even more with powerful speeches breaking out everywhere, chalking, a die-in, song and dance, chants, and so on. Police taped up the side entrance we came in and another set of stairs next to it, but the front facing City Hall behind us remained open. Some protesters went in to give comments at the Police Commission meeting, but cameras weren’t allowed to go in. I also asked Captain Graham, the one cop who seemed to have slight conversational ability, why she was arrested, and he said for trespassing, even though I pointed out and he confirmed that the Police Commission held a public meeting. This video also cut out halfway through my questioning. After that I charged again, returned around 1pm when the rest were leaving the LAPD HQ, to walk over to the city jail and find out where their friends were. On the way off the premises, one protester started speaking about their friend just getting beat up and some production guy tried to grab or push the girl who was speaking. It conflated quickly and the guy backed away and said he was calling the cops (started video then), and they moved the camera away, but then moved it back to record the girl yelling. It dissipated as quickly as it heated up and the group continued on to the Los Angeles Detention Center. We went into the jail visiting lobby and P.M. Beers and Cassandra Fairbanks (Twitter: @CassandraRules and @PMBeers) asked the cop for info on Lissa, and he eventually said she was being booked there and gave the code of her offense- said she must’ve asked the cop to fight her- to which Cassandra replied there is no way that happened, she was right there. I got some of this on video and then they told me cameras weren’t allowed. So, I put it down and got the second part on audio. I believe they then got the info of the second girl, while I once again had to recharge. On the way back around 1:30-2, as we headed out, a protester told another rehearsing mainstream media reporter about the 5 cops beating up a young girl, and he just kept a very smug smile on his face and repeatedly said “thanks for your opinion” and such, very snarky and fake. I returned later that day around 9pm, told there’d be more protesting, but it may have been too late and all I saw was lots more chalking (Las Vegas’ Sunset Activist Collective member Ballentine paid a visit that I didn’t even expect), and barricades just brought out by police since the protest. I suppose in preparation for following days. There is another bigger march planned for Saturday March 7th, which I will likely make, but I encourage everyone to go who can. Add Jason on Facebook at http://facebook.com/jason.nellis.3 or follow him on Twitter @jazoof and read his blog to keep up on updates, as well as future activism in and around Las Vegas (or possibly LA).